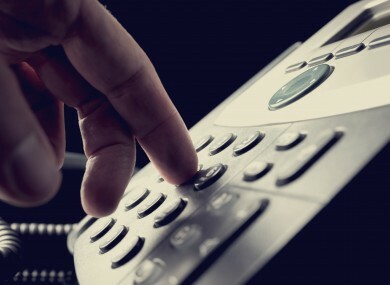 FORTY SIX PER cent of calls made to a helpline for crime victims last year were as a result of an assault or burglary. The Crime Victims Helpline is a national independent and confidential helpline which was established to listen to, support and inform victims of crime. The helpline had over 3,200 contacts with victims of crime and others who were seeking information and support. Harassment and stalking accounted for an additional 14% of the contacts. 40% of the victims of crime who contacted the helpline were looking for emotional support, with 37% calling up in search of information about the criminal justice system. Three-quarters of the helpline’s contacts were made by victims and the remaining contacts were with friends or family members; other service providers such as GPs or counsellors and members of An Garda Síochána. 2,688 contacts were made to the listening and support service by phone, while the remaining contacts were made by text, email, or post. As in previous years, the helpline received more contacts from women than men. In November 2015 the European Directive on Victims’ Rights came into effect in Ireland and across the EU. The directive was welcomed as a major step in ensuring that victims of crime would no longer feel excluded from the justice system. Email “Assault and burglary account for nearly half the calls received by the Crime Victims Helpline in 2015”. Feedback on “Assault and burglary account for nearly half the calls received by the Crime Victims Helpline in 2015”.